At First Texas Homes, one of our keys to success is hiring top-quality people whose first priority is the needs of our customers. Our brilliant sales consultants and knowledgeable building managers always strive to provide the highest level of customer service. 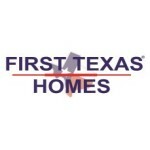 Founded out of over 45 years of family history in residential building and development, First Texas Homes has been building quality homes in Texas for more than a quarter-­century. Our unique approach to homebuilding incorporates in-­house architectural planning, with unparalleled design flexibility. We believe that allowing our customers to incorporate their vision, by making changes to our acclaimed floor plans, helps to turn a simple house into a welcoming home. This Unprecedented flexibility, unique to First Texas Homes, ensures that you will receive a truly custom-quality home, as well as the absolute best value for your new-­home dollars. With great success in our Texas markets, and an ever-­increasing presence in the most sought-­after communities, First Texas is sure to be building in a neighborhood you’ll be proud to call ‘home’. As a recognized leader in the industry, First Texas Homes has established a proven track record of putting the needs of our customers first. We take great pride in our unrivaled customer service, and ensure total satisfaction by involving our buyers in every step of the building process. With customer needs at the forefront of our operation, we’re dedicated to providing long-­term value by decreasing the overall cost of home-ownership. The industry-leading, energy ­efficiency of every new First Texas home is achieved by taking advantage of the latest advances in energy-­saving building techniques, as well as the use of high efficiency appliances, fixtures, and mechanical systems. With First Texas Homes, you’ll get everything you’ve been looking for: exceptional quality, energy-­saving construction, superior design flexibility, and, most importantly, the absolute best new-home value.